SuperData Research released their chart for February digital sales this week, so we have new data to gaze upon. On the PC end of the chart, the top four remained in the same positions we saw them in January, with League of Legends still in second place. The interesting bit comes with fifth and sixth place, the race between Fortnite and the newly launched Apex Legends. Apex Legends was on fire from the moment it launched, heading to a huge number of players very quickly. SuperData posted a supplementary chart on Twitter about the quick growth of Apex Legends. For all that speed and hype however, Fortnite managed to stay ahead of the bright new star of Apex Legends, grabbing fifth place while the new kid ended up in sixth. Missing completely from the chart is last month’s sixth place finisher, PlayerUnknown’s Battlegrounds. So maybe we know who took the hit on that front. 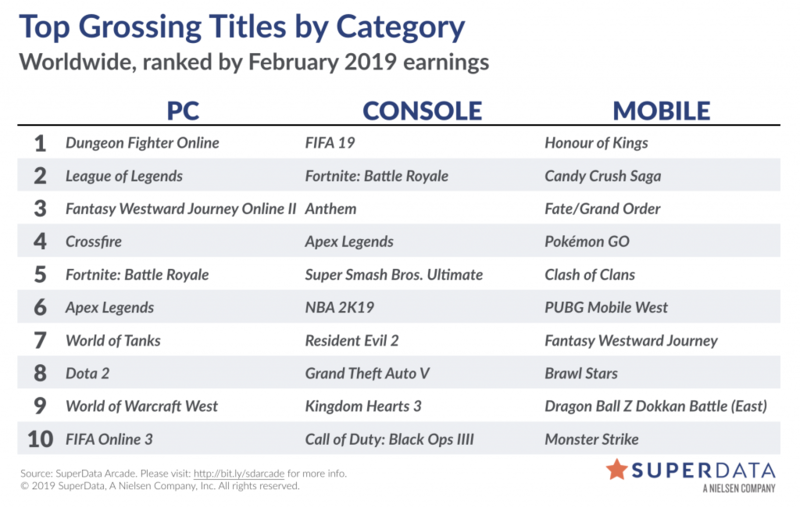 The rest of the chart is rounded out by World of Tanks, which climbed up a spot to seventh, DOTA 2, which went from tenth last month to eighth, Word of Warcraft, still flagged as “West,” which is down in ninth, and FIFA 19 Online, making its first appearance on the chart in tenth. Also missing from the PC chart is BioWare’s Anthem, another big February launch. However, unlike Apex Legends, a lot of what is being said about Anthem is negative. In the middle on the console chart FIFA 19 and Fortnite held on to first and second place. Then we have the two big February launches, Anthem and Apex Legends in third and fourth. Then there is Super Smash Bros. Ultimate, holding on to fifth, keeping it on the upper half of the chart for three months running. Down the list, Grand Theft Auto V stayed alive another month, clocking in at eighth. On the mobile chart, the top five stayed the same, with Candy Crush Saga and Pokemon Go swapping positions compared to last month. Of note is sixth place entry PlayerUnknowns Battlegrounds Mobile, the first time one of the mobile ports of a battle royale title has made the cut. For comparison, EEDAR also has their list out for February, which mostly combines digital and retail, and which is US only, making it the orange to SuperData’s apple I suppose. EEDAR’s report also shows Apex Legends topping the social media impressions, followed by Fortnite, League of Legends, CD:GO and DOTA 2. Back to SuperData’s report for February, it contained the following supplementary notes on the digital video games market for February 2019. This entry was posted in entertainment, SuperData Research, World of Warcraft and tagged Anthem, Apex Legends, EEDAR, Fortnite on March 22, 2019 by Wilhelm Arcturus.